Skills required: long-tail cast on, knitting, purling, increasing, decreasing, knitting in the round, picking up stitches, working a simple cable pattern (chart and written instructions provided. ), wet-blocking. Construction: Ideal for an intermediate knitter, this cardigan is knit seamlessly from the top down, with an offset, work-as-you-go buttonhand. The raglan yoke is worked flat, with a simple cabled pattern on the right front, offset by garter stitch (the back is stockinette).The sleeve stitches are held while the body is worked, then the sleeve stitches are worked in the round. Both charts and written instructions are provided for the cable pattern. NOTE: This cardigan requires careful wet-blocking, I strongly discourage you from skipping this step. Miel is French for “honey” (pronounced “mee-ehl”). The lush texture of the honeycomb cable pattern is brought out by sweet garter stitch. The yarn chosen will take this covetable cardigan either in a cozy/soft, or a tweedy/rustic direction. Only the right front features the cable panel. The left front is garter stitch while the back and sleeves are worked in stockinette stitch. So you only have to focus on the easily-memorized cable panel on one of the fronts as you work this cardigan. This stylish piece is both special and practical, and suits boys as well as girls. 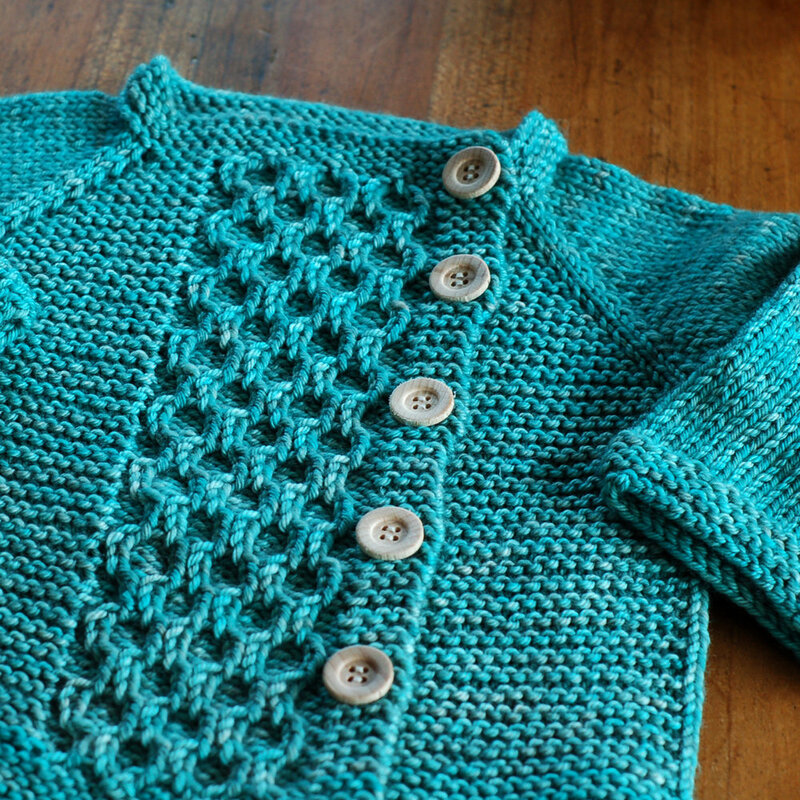 The individual pattern is available for purchase in pdf format for 5.75 Euros (sizes 3mo to 8yo). Garment chest: 20.25 (21, 22.25, 23 // 23.75, 25.75, 27.75, 28.75) inches or 51.5 (53.5, 56.5, 58.5 // 60.5, 65.5, 70.5, 73) cm. Approx 300 (350, 400, 450 // 500, 550, 650, 700) yds or 274 (320, 366, 411 // 457, 503, 549, 594) m of dk weight merino or merino blend yarn. Please make sure you use a yarn that will block well (no synthetics).